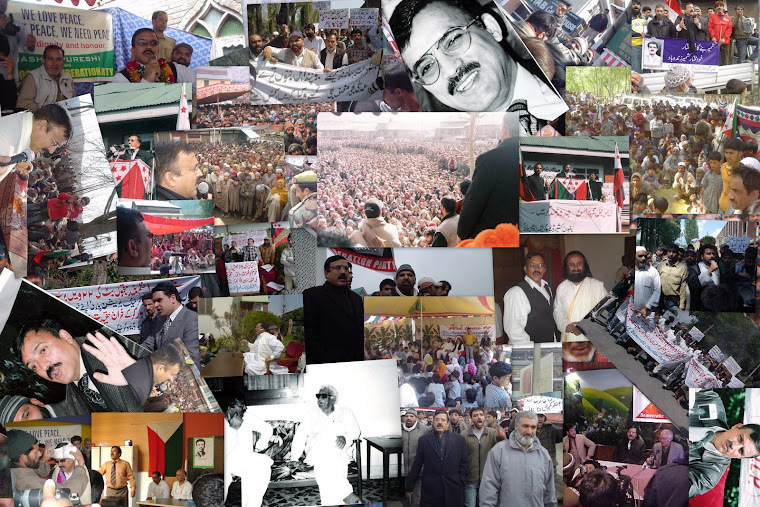 Since the outbreak of armed struggle in Kashmir valley, the Kashmiri youth and innocent civilians are being killed, arrested tortured, and jailed while plenty of Pakistan and so called Azad Kashmir based organization and individuals, both in Pakistan and abroad are engaged in collecting cores of rupees as donation in the name of kashmiris, in the offices, roads, buses, mosques and other public places. Till now, there is no authentic information from any part of Kashmir, whether anyone has distributed even 10% of the collected funds among the victims or oppressed people of Kashmir. However, some groups and organizations give a little part of the fund raised to certain leaders to please them for seeking their blessings for further collection of donations. But in Pakistan and so called Azad Kashmir, it is being propagated that they are providing help and relief to orphans, widows, and families of the martyrs in Indian held Kashmir. These organizations are making highly impressive claims regarding their relief efforts in efforts to raise more money from well intentioned donors. The organizations which collect donation are giving fake advertisements that they are running blood banks and sewing schools for the ladies in Kupwara, Doda, and Rajori. They also claim to have provided blankets, oil, and other commodities of daily use to the victims of Charar-e- Sharif (over 1500 families). The Daily Jang( London) dated November 30 1995 has also carried a big advertisement titled “Kashmir Appeal” elaborating eight projects of the detailed program chalked out the name of “Muslim Hands”. 1 Nine Sewing Schools for the widows of the martyrs and needy women have been opened in Srinagar, Kupwara, Doda and Muzaffarabad. Two blood banks have been established to provide blood to injured persons in Rajouri and Kupwara. Over 1500 affected families of Charar-e-Sharif have been provided food grains, blankets, oil, and other commodities of daily use. A part from this, the advertisement also carried the announcement regarding establishment of a dispensary and medical laboratory at Tatrikot. In this case, the Muslim of U.K and Europe donated over 7 lakh rupees for the people of Kashmir. At the end 01159704490 Credit Card hot line number was given. A number of other such organization operating in U.K, Europe and America are making such false appeals and the tragic reality on the ground in Kashmir is that no project is being funded by the so-called” relief organization”. When I contacted an eminent journalist in Srinagar in this regard, I came to know that there was no such project operating anywhere in Kashmir. Similarly, I contacted a journalist in Rajouri who also denied the presence of any blood bank and there is no knowledge of any provision of help to the victims of Charar-e-Sharif under the name of Muslim Hand. It is tragic that Daily”Jang” (London) dated July 16, 1995 even carried a picture of a truck. The caption says, “Muslim Hands” Britain has sent first consignment of relief material for the victims of Charar-e- Sharif incident. In this picture some relief material is being unloaded. If we see the picture carefully, it seems some place is in Azad Kashmir. Unfortunately, this is Just is the tip of the iceberg. A conversation with one local journalist who has investigated into the corruption in the financial networks revealed the methods of deception that these fraudulent “relief organization” use in order to deceive well- intentioned donors in UK and USA. This journalist describes an incident which happened in front of his very eyes while taking tea at a local restaurant in Srinagar. Apparently, a group of men visiting from UK got out of a car clad in suits; they were carrying a sign along the lines of “Kashmir Muslim Relief Dispensary.” The group went into a local Medico shop (commercial medicine dispensary) held a brief conversation and played a small sum to the owner of the shop. After which the men placed their newly painted sigh in front of the shop`s real sign and proceeded to pose for a few photographs next to the sign. The men then took down their sign and drove off. The local journalist was surprised at the level of dishonesty displayed in broad daylight. Moreover, it has become quite apparent that some APHC leaders have directly been involved in financial corruption and have directly benefitted from such dealings. APHC leaders who have been able to travel abroad are said to have used these trips to raise enormous sums which they say would be used for the Kashmiri people yet this money is only used for their personal use. APHC is said to have collected some 36 crore rupees from sympathetic donors throughout the world in the name of reconstruction of Charar-e- Sharif. Rampant corruption seems to have plagued the leadership of APHC. There are many people in the world who are always ready to help the oppressed and poor but some selfish individuals are taking advantage in the name of kashmiri blood. Likewise, the kashmiri people are also being deceived in connection with the aid, like the politics. The same type of corruption can be seen in Pakistan and India. An attractive office has been opened in Satellite Town, Rawalpindi for aid to Kashmiris. Once, an advertisement was given by that office that” Mujahideen may contact, as they wanted to help the mujahideen particularly those coming from Indian held Kashmir.” On contact by a few youth, coming from Indian held Kashmir, they were given “Receipt Books” with the instructions to visit door to door to collect donations. With this donation, a JKLF leader has converted his two room house into two five- room bungalows in Muzafarabad. He has no personal income but owns two cars for his personal use. His two children are studying at Army School, Muree. This leader was attacked twice by the Kashmiri youth. His nephew was involved in stealing and selling the ammunition. In the same way, the Chief of “Militant Wing” of this party who was selling vegetables at an old bus stand in Muzafarabad now own a good house with the blessing of Amanullah Khan. He is working as a contractor now and is a millionaire. Amanullah Khan himself rented an air-conditioned bungalow at Murree Road. He also purchased a bungalow in Defense colony, Karachi for his children. Apart from this, any potential activists of second or third class, coming from the valley, are seen riding Pajero jeeps with mobile phones. They are living luxurious lives though the money collected in the name of Kashmir, while the common youth of Kashmir have been kept in camps in the name of Jihad, where they wait before being sent back without proper training or equipment to face heavily armed and well trained Indian soldiers. They are being sent back and massacred like lambs at the slaughter houses. The Govt. of Pakistan had written a detailed letter of allegations to AJK president and his son for withdrawing 24 crore rupees Zakat fund. Sardar Attiq purchased a house for two corers in Britain. Motmor Islami issued 4000 visas for youth of refugees for Saudi Arabia and Kuwait but Sardar Attiq with the collaboration of recruiting agents sold them for crores, Huge sums collected in the name of Jehad in foreign countries, were used by Sardar Quyoom and his son for purchasing a petrol pump in Jeddah. Jamaat-e- Islami which also has to fund its Hizbul Mujahideen has been involved in the most complex financial corruption collecting money from both ISI for militancy efforts and collecting money for so called “relief” through its many front organizations, the two most prominent being in UK and USA. The Jamaat has shown no shame in its fraudulent financial dealings. The Jamaat runs the most highly effective fundraising campaign. Annually in the USA and UK extravagant full page advertisements are placed in magazine with large circulation amongst the Muslim communities there. These advertisements are published year round but are witnessed mostly during the Holy month of Ramadan. Some advertisements collect money Eid-ul- Azha from Muslims who want helps the needy in kashmir. Needless, to say there are no such sacrificial animal going to Indian held Kashmir. When one Kashmiri enquired from a number of these “relief organization” how money was made available for relief efforts in Indian held Kashmir, these organizations said they gave the money to “PRT”. “PRT” refers to the “Public Relief Trust” of Jamaat –e Islami. The PRT serves as the main conduit for funding of Jamaat and there is no telling where and how this money collected in the name of “Kashmir Relief” is spent. But this money is spent can be from the life style of some of the Jamaat leaders and Hizbul Mujahideen leaders. The infamous “Salahudin” fled Indian held Kashmir when Indian military pressure Hizbul Mujahideen. Only when Hizbul Mujahideen had effectively wiped out the JKLF and other groups fighting against occupation. He now lives in Muzafarabad and enjoy a safe and comfortable lifestyle. Geelani Sahib himself is said to have collected 10 crores in the name of relief for Charar-e- Sharif. Many Jamaat leaders live luxuriously while the young people in HM continue to be “fed to the lion”. It is precisely the blood of these poor youth who are the source of the Jamaat and others to collect huge sums for personal use. The Jamaat runs an office in Saudi Arabia and collect money from Muslims who come for pilgrimage. At this office picture of Shaheed Ishfaq Majid Wani was seen framed on a wall with the label” Rookni-e- Jamaat” (Jamaat member). It was the Jamaat that wrote in a press release after Ishfaq`s death that he was not a Shaheed and “KJLF`s Qibla faces towards Moscow not Mecca.” But the Jamaat did not hesitate to use picture to raise money. False picture and false projects are all part of their elaborate advertisement for fundraising efforts. One of the most bizarre aspects of this corruption is that in Srinagar a number of these leaders have built huge mansions in Srinagar the heart of the battle field. While the fraudulent relief organizations present the facts of how many homes have been destroyed in Kashmir, the leaders who receive fair- share of the proceeds have built multiple houses in Srinagar of a very luxurious nature. And their counter parts have done the same in Pakistan. It is now usual to hear about some leaders who has no income having houses worth value of 65 lakh. One such leader has built a huge mansion in Srinagar whose house stands out as a brand new beautiful bungalow surrounded by simple homes that have been burnt down and razed to the ground because of military operations and clashes. Some other leaders have even bought luxurious flats in New Delhi and have rented these out as a source of income a very strange investment for a group of leaders who claim they seek to bring about the freedom of J&K from New Delhi. A part from this, Ayub Thakur has set up an office in England in the name of Kashmir. Annexation with Pakistan literature is published from this office. Thakur also contacts British writers and gets books published by providing them reports from Pakistani broadcasting and secret agencies. People says, “that he has also purchased two, three houses in the expensive London real estate market.” Once, in 1993, I asked this man about his source of income. In reply he told that there were two kashmiri doctors in USA who send him three lakh dollars annually as donation. When I wanted to know their names and addresses, he quickly became nervous and tried to avoid the subject. I questioned because every knowledgeable person knows very well that Kashmiri doctors in America and Europe are not in a position to donate such heavy amounts. Above doctors story was also confirmed by one Kashmiri who lives in UK.”It has become second hand knowledge that Thakur is salaried by Pakistan`s intelligence, but it has also come other organizations have served as conduits for money used for the personal benefit of certain leaders. Recently an elaborate scandal in this regards has been exposed in Kashmir. The Kashmir Muslim Trust in Kashmir has been found to be a conduit for the Jamaat leader’s share of the money raised from “PRT” persons like Thakur and ISI. Three people Abdul Gaffar Sofi, Hillal Ahmed Shah, and Mohammad Shafi Mir have been arrested in this most recently exposed corruption scandal. The full details of this fresh corruption scandal were published in the Greater Kashmir, Excelsior etc. on December 24 1997. The arrested have allegedly confessed that they were getting money through Mr. Thakur and Fai in the name of Kashmir relief; which actually ended up in the pocket of a Ghulam Mohammad Khan, the divisional commander of HM for north Kashmir. What is the more important is that money collected in the name of Kashmir, first “taxed” by the international middlemen like Thakur, then “taxed” by the local middlemen and then finally sent for militancy operations of HM only ended up in the personal use of HM commander. Thus in this particular scandal not a single penny was against Indian Occupation. According to the Kashmiri media reports they uncovered just one transaction of 1.72 crores as yet in this freshly uncovered scandal, which the newspapers say is just a tip of the ice- berg. The surface of the financial networks has barely been touched, but it has become tragically clear that many people involved in the Kashmir struggle have betrayed the people of Kashmir and have collected money to finance their lifestyle. And for that these people have sold Kashmiri blood very cheaply. We may never know the exact amount, how many middlemen have been there and how many houses have been built, but one thing sure- rampant corruption has been found to exist amongst the leaders APHC Jamaat-e- Islami, and other groups/ individuals. Allegations of corruption have been there ever since Kashmiri people started noticing the changed lifestyles of leaders and professional activists in Srinagar,” Azad Kashmir”(POK) UK and USA. While the last 9 years have been years of misery to the masses, these few people have benefitted heavily from the business they have setup in the name of Kashmir blood. As the common people learned about the corruption disenchantment has increased. And those who have had a hand in this financial corruption are responsible for this. Whereas, knowledge of the corruption was only known to a few of us who was painfully witnessing Kashmiri blood being sold cheaply, now this has all become common place knowledge. The common people know each and everything about these leaders, they have seen their mansions built during these nine years. In April 1997, the Shoura –e- Jahad, or Council of the five main militant organizations in Kashmir, came out with an announcement in response to public opinion. The Shoura-e- Jehad suspects that high profile Hurriyat leaders have misappropriated money meant for the movement. The luxurious lifestyles of several Hurriyat leaders have not gone unnoticed by the militants, who today realize that while they are risking their lives, the over ground leadership is living an easy life with wealth, publicity, travel and enjoying security cover provided by the Jammu and Kashmir government. The State government has been spending over Rs 2.70 Lakh every month on the security arrangements of three prominent leaders of APHC. The fact that Shour-e-Jehad has demanded accountability further underscores the need for help accountability leadership`s. It is a sad fact that lakh of Kashmiri families have faced destruction while a few families are plying in millions after cost. At the same time nothing is being done to provide relief to those Kashmiri who are in real need for assistance. There are such mothers in Kashmir who cannot see their sons in jails due to lack of bus fare and other expenses. It is with an intention to provide some assistance while displaying honest and transparent financial handling that JKDLP has established the MNWA trust. Aid has been provided to amputees. Initially, three handicraft schools were opened for women. In Trigam and Handwara, sewing machines were distributed among widows. It has modestly functioned to do honestly whatever it could. It has a plan for construction of a school, dispensary, and orphanage in Srinagar – land has already been acquired for this purpose. We wish to maintain a completely honest procedure without any chance of corruption. For this reason, we do not accept donations by hand. We have opened an account in J&K bank and have appealed that donations be sent directly to the account. We have documented how exactly money is spent. More efforts should be made to bring up honest and effective relief organizations in Kashmir. Some of the leaders accused of corruption have come out vehemently against MNWA, because they stand to lose their corrupt income. Organizations like MNWA give a credible option for sympathetic human being to provide real relief to the Kashmiris in need of assistance and will prove deadly for organizations and leaders who have earned/collected donations and misused it. Kashmiri people are living under the fear of Gun and they are innocent as they have not held accountability of those who while launching the armed struggle had misled the kashmiris that Pakistan would attack on kashmir within three to six months. Kashmiris also did not ask those who sent their sons across the border in the name of Jehad and who have not returned so far. Kashmiris also do not ask those who give calls of strike in Kashmir and ruined the entire economy of Kashmir. Kashmiris also do not raise questions about killing of innocents, kidnapping of girls, and their molestation. Kashmiris are so “frightened” that they observe strike on the call of Hizb-Ul-Mujahideen one day while they also take part in the strike call by others outfit against Hizb-Ul- Mujahideen next day. Above all, it is a good habit, of Kashmiris that they also kill innocent people walking on the road, when they involve in group clashes. After doing all this, in order to escape they would hold Indian agents responsible. The leaders would also get salvation from theaccountability by their respective organizations and the people are habitual of forgetting the things. They do not listen to the statements of different leaders and organizations made from time to time. A prominent leader remained in Congress and worked as minister. 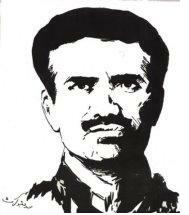 Later he joined Janta Party and took oath of allegiance to India but he stood by the Kashmiris, when the later came on the roads for freedom, and during his visit to England and Europe, when he got his medical treatment courtesy Pakistani money, then in excitement just to please his masters (Pakistan) he described all those “Kashmiris as traitors who support independence for kashmir”. 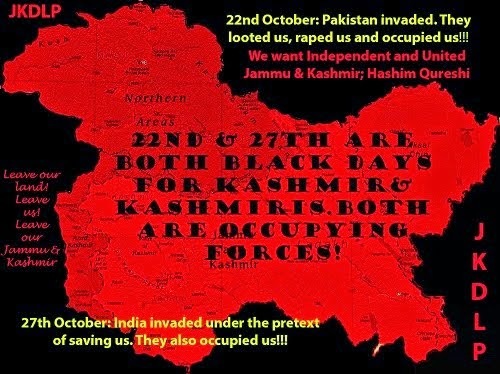 Because Nawabazada Nasserullah Khan, Benazir Bhutto, Assif Ahmed Khan and Jamaat-e-Islaami also describe the Kashmiris as Indian agents who consider Kashmir one unit and support independence. Besides this, Amanullah Khan and his puppet also describe Yasin Malik, Javeed Mir and other as Indian agents. 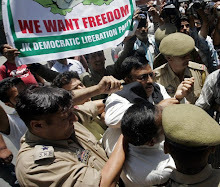 Four years ago, I had written a detailed letter to Javeed Mir that they would certainly level allegations against him as they had levellled against senior JKLF leaders. But my words were ignored by these youths and today my words have been proved true. This article was written to appraise the Kashmir nation about the black deeds of those who collect donations in the name of widows, orphans, jailed youth who are facing torture in torture cell. Two years back, 17 people were killed and 140 others injured in a powerful bomb blast in the Egyptian Embassy. According to Pakistan broadcasting source, people of Pakistan expressed strong reaction against the blast. Ex-Prime Minister Benazir Bhutto clearly announced that some religious institutions were involved in it and she had confirmed information that religious institutions and Madrasses are were training of arms and ammunition to students for creating law and order problem for the government. In the same way, ex- Foreign Minister Sardar Asif Ahmed Ali described this blast as anti-Islamic and inhuman act. Indian politicians, making hue and cry of non- violence in the name of Gandhi Ji, have forgotten that love was the religion of Gandhi Ji. Peace cannot be established by killing youth in custody. It will only add fuel to the fire of revenge and hatred which increases violence.